If you have been meaning to invest in our Homemade Sushi Kit, have a hankering for instant noodles, or want to unwind with some soothing green tea, now is the perfect time to order; it’s just like shopping in-store but without the hassle of lugging your haul home! Don’t forget, we now offer Free Delivery on all orders over £75 for UK mainland customers! 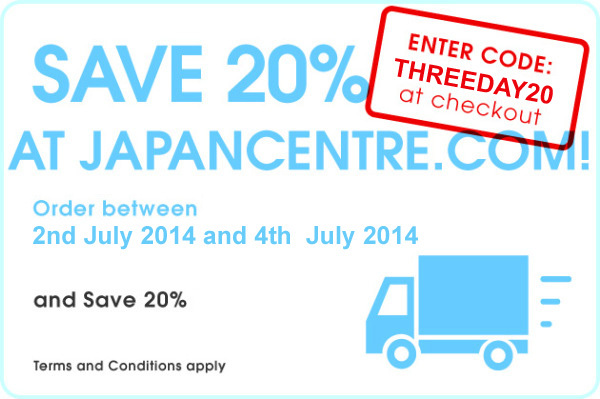 Valid on orders received between 12:00am on Wednesday 2nd July and 11:59pm on Friday 4th July 2014 only. Code THREEDAY20 must be entered at checkout for the offer to be applied to the order. Offer valid for food items only. Not valid on alcohol, homeware, books, magazines, or electrical. Discount is not applied to postage fees. Offer does not apply to items already discounted.